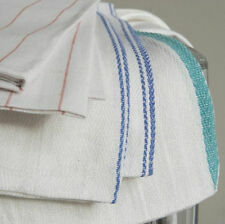 STRIPE LOW LINT TOWELS! THESE TOWELS ARE JUMBO 15X18 PREMIUM 100% COTTON. SAVE BIG WITH OUR VALUE VS BUYING FROM YOUR LOCAL FOOD REP! 10 LBBOX OF ASSORTED. WHY BUY ELSEWHERE FOR A TON OF MONEY WHEN YOU CAN SAVE! STRIPE LOW LINT TOWELS ! THESE TOWELS ARE JUMBO 15X18 PREMIUM 100% COTTON. SAVE BIG WITH OUR VALUE VS BUYING FROM YOUR LOCAL FOOD REP! LBBOX OF ASSORTED. WHY BUY ELSEWHERE FOR A TON OF MONEY WHEN YOU CAN SAVE! Have some fun!!!!! NEW HANDCRAFTED Retractable round badge reel I D Reel diameter 1-1/4 inch (32 mm) Cord length 34 inches (864 mm) gives you an extended reach for easy clocking in and out. clip on back of the reel. HOUSEKEEPER MINION Get this for your favorite HOUSEKEEPER or have some fun and get it for yourself! Clear vinyl strap with stainless snap to secure credentials. Great gift for medical personnel, nurses, teacher, and office staff. Thanks for looking at my page. For sale is a Royce Rolls Stainless Steel Double Tank Unit with one Stainless Steel 16-24 Oz. Mop Wringer and two Stainless Steel half oval 7 1/2 gallon tanks. VILEDA cleaning trolley with Vileda vacuum cleaner - easy to assemble - with a wide range of accessories Safety Warning WARNING! NOT SUITABLE FOR CHILDREN UNDER THREE YEARS. Contains small parts and/or small parts that can be torn off and may, for example. Vileda Steam Floor Cleaner Safety Warning WARNING! NOT SUITABLE FOR CHILDREN UNDER THREE YEARS. Contains small parts and/or small parts that can be torn off and may, for example. Be swallowed. Choking hazard. Features of Rubbermaid 9T90 9-Pocket Hanging Tool Organiser. Specifications of Rubbermaid 9-Pocket Hanging Tool Organiser. Suitable to attach to large number of Rubbermaid Housekeeping and. New! Pack of 8 Window Washing Squeegees with 20" Handle . Condition is New. Shipped with USPS Priority Mail. Features: Rust and corrosion resistant construction Brass standard garden hose coupler, aluminum washer wand tubing, TPR handle Perfect for electric cold water pressure washers It can be used as wash water gun, garden irrigation tools Ideal for garden watering, agricultural irrigating, car washing, household cleaning and so on Description: 100% Brand New and quality Material: Aluminium Alloy(body) Copper(Nozzle head) TPR(handle) Color: As Pictures Shown Size:Length 46.5cm(Approximately). Meiko Doppelfahreimer verchromt mit Presse MK 2 2x15 Liter NEU !!! – robuste Kunststoffpresse MK2. – Lenkrollen 80 mm. Die Ware wird unter Ausschluss jeglicher Gewährleistung verkauft. Un chariot de nettoyage avec roulettes et presse à plat avec poignée. Un chariot de nettoyage avec roulettes et presse à plat avec poignée. composé de deux seaux de lavage d'une contenance de 15 L chacun et amovible. 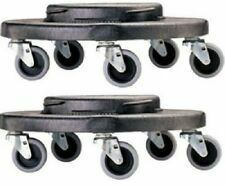 Chariot ultra-compact est fourni avec ces roulettes et sa presse d'essorage. El polipropileno resistente resiste el agrietamiento, la peladura y la corrosión. Tres estantes duraderos con bordes elevados mantienen los artículos organizados. Incluye una bolsa de nylon de 25 galones para la recolección de residuos o lavandería. • Here is an adorable Theo Klein Bosch Service Car Station/ Hands-on Engine Playset, very real looking entertaining. • You'll love sharing your engine knowledge and watching your youngster perform all of these jobs opening the engine cover, replacing sparkplugs, checking the air filter, removing the motor, replacing the battery, repairing headlights, checking the oil, replacing coolant, jacking up the vehicle, replacing the wheel, replacing a shock strut, replacing a mudguard, checking the horn, repairing the ignition and adding a ramp for racing model cars. 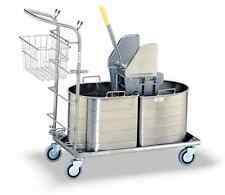 This Vileda cleaning trolley from Theo Klein is including. - A broom, a flat floor mop, a small broom with broom shovel and a bucket. - A vacuum cleaner with styrofoam balls. Item model number: 6742.